Most Midwestern and southeastern anglers begin their fishing careers by catching one of the catfish species from the lowly bullhead to the larger flathead, channel or blue cats. It is truly America’s fish. Catfish inhabit large rivers, impoundments, creeks, salt water or fresh. They are everywhere! 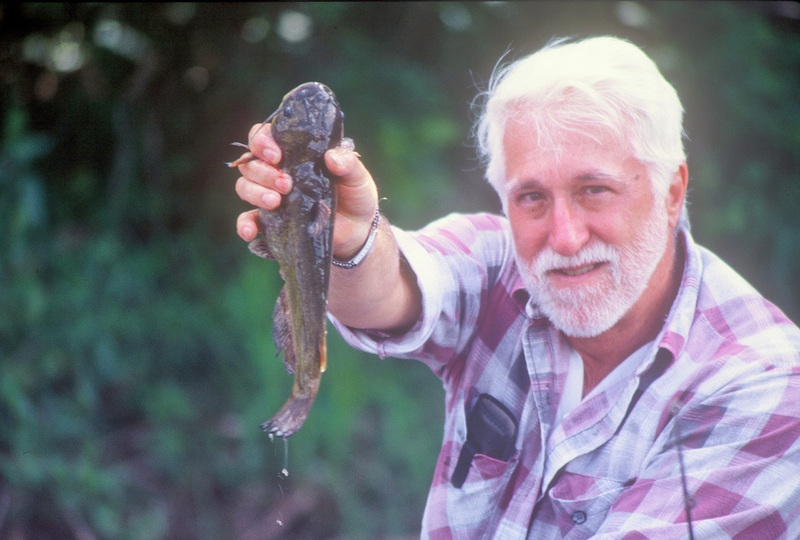 I began with bullheads in a creek near my home in northern Iowa. It has become a life long love affair with the whiskered wonders. Channel catfish are probably the most popular single species of fish for eating and catching. Almost every angler with whom one speaks has a theory on how to fix catfish bait and where to find the big ones. Catfish anglers are probably the most laid back and comfortable anglers. They tend to like a leisurely time. The rigs are simple with a weight and hook on a line cast into the probable location. A long slender fish, the channel catfish is a pale blue or greenish above and whitish or silver below. Although similar in size and shape to other catfish, the forked tail and black spots on the side identifies the channel cat. Popular with aqua culturists, they are very suitable for fish farming operations. Channel catfish reach a keeper size of 12 to 14 inches by their third or fourth years. This age class is generally the best eating fish. The largest fish reach at length of 40 inches and a weight of 30 pounds. Larger ones do exist but they are rare and usually constitute record class. Channel catfish tend to seek out clean water with sand, gravel or rock bottom. A nocturnal feeder, channel catfish spend most of the year hidden in cavities or lying in deeper pools during the day. They move to shallower water to feed during the nighttime. The external taste buds of the catfish are located in the four pairs of barbels or whiskers of the animal. These bottom-feeding senses of taste and touch are more important than its sight. While moving across the bottom, they feed on fish, insects, crawfish, mollusks and some plant material. Cast the line, and then prop the rod up on a forked stick sunk into the bank. Other variations on this theme work from boats or on shore. 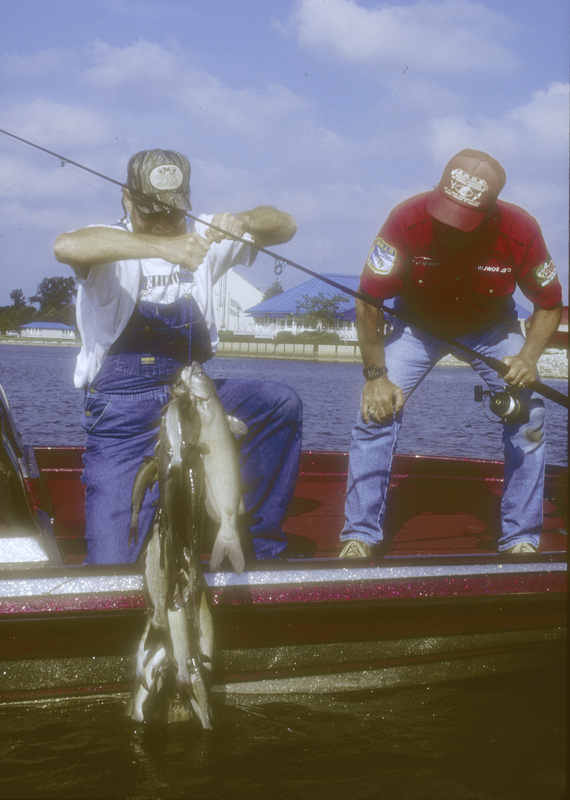 The basic technique is common to all fishing for channel catfish. Bait used for catfish is either live or dead and can range from minnows to leeches, crayfish, catalpa worms, leaf worms, red worms, frogs and cut bait. Some people will use chicken or turkey livers. For the most sophisticated catfish angler there are patterns to fish. One of these is especially popular on small rivers and streams during summer. Ground pounders wade and fishes live bait. The pattern involves fishing the bait below a slip float and allowing it to drift downstream over the larger holes, washouts, undercut banks, beneath brush piles and other dark hideouts. The idea is to present a natural presentation of the bait by allowing the current to drift the bait in a natural manner. The bait is set so that it floats just a few inches off the bottom. Good baits for this kind of fishing include minnows, grasshoppers, crayfish and nightcrawlers. These are natural forage for the catfish usually swept away into the current during rain or flooding. During periods of overcast or drizzle, channel cats cruise the flats in search of food much as they do at night. Fishing in such conditions calls for a 3-way rig. One of the swivels attaches to the line that goes to the rod. The second swivel attaches to a drop line of about 8 inches that has a heavy sinker on it. The third swivel goes to a line of about three-feet in length and has a hook on the end. The bait on the hook floats off the bottom and present either a minnow or leech in a natural looking presentation. Cast upstream, allowing the bait to wash along the bottom and fall off the edge into any holes. Catfish will often be waiting in ambush. Another pattern for the ground pounder is looking for a point of land or a large tree that has fallen into the water and is blocking current. Often fish are in the eddy hole behind the current break. It is a good idea to remember that catfish love cover. They will hold around rocks and stumps in rough areas. Once one sets the hook, the fish will do his best to break the line. It is a good idea to use a tough line of at least 12-pound test and the same color as the water. If seeking larger fish, try one of the braided lines with more strength. Tough line helps prevent the sandpaper-like teeth of the catfish from wearing or weakening the line. That can cause a beak at the most inopportune time. A high quality tough line will allow the angler to fish around rocky, stumpy underwater terrain. Catfishing is a great way to spend the day or to introduce someone new to the sport. It provides action and good chance of success with a great dinner in the evening. With some of these tips, anglers can fish more rivers and streams closer to home. It will increase quality time on the water for young and old. Summer fishing seasons tend to bring out the crowds. Regardless of the species involved, there are times when the anglers appear to close along a stream or lake shoreline. To some this is a turn off and they decide to fish another day. It is still possible to relish summer, the social atmosphere and consider a fish caught as a bonus. Many acres of public access fishing ideal for summer recreation are available across the country. The rules of fishing etiquette are unwritten. It is possible to learn them only through trial and error. It takes guts to fish in a crowded area. Fishing in a crowd is always entertaining and can be downright enjoyable. There are those seasoned “pros” eager to share their skills and a few verbal barbs. The latter often lead to some great entertainment. The carnival-like atmosphere can send an adrenalin rush coursing through your body. The easiest way to outsmart the other guys and get the good spots is to get there early. Scout the area a few days prior to opening and find the areas with eddies and how water flows under or over logs. These are holding areas for fish. The early morning fish is not very active due to the cooler water temperatures. This fish will find resting areas next to current and let the water bring food to him. Once you have picked your fishing area, get there before dawn and hold it. Others will move in on you but you will still have the area you selected. Another way to be successful under crowded conditions is to fish differently than the other guy. This could be using a different lure or using another pattern. Sometimes by such a change you are presenting something that the fish have not been looking at all day long. It seems that they will get accustomed to a particular offering and just begin to ignore it. Accurately casting a lure is vital in crowded conditions. It not only keeps you from tangling the other guy’s line but also it puts your offering right where you want it. You will be able to get your lure or bait right in some tight spots that others will ignore fearing getting hung up. The best fish holding cover can be in the most inconvenient places. A person who can cast accurately can make the most of those places. Casting to those out the way places may require wading with care. Falling into the water can be uncomfortable at best and deadly at worst. Wearing waders is probably a good idea in any case. The snug fitting neoprene waders have less water resistance. Hip boots do not provide enough protection from getting clothing wet and ruining a good day. Good traction is a key to wading safety. A wading staff will help determine depth of water before stepping off into it. It is good to keep the staff upstream from you and to lean into it forming a tripod (your two legs and the staff.) Always make sure to keep two legs of your tripod firmly implanted on the bottom. Finally, one tip to fishing usually crowded conditions. Fish during the week instead of weekends, it is often less crowded. Fishing those crowded days can be a pain. But, it also can be a lot of fun as there are some really fun people out there with all sorts of rigs. Be observant and courteous and you might make some new friends and learn some new techniques. In any event, it is better than working all day. Pulling out of Cape Fear Marina in West Branson, MO the air temperature was an unseasonable 50-degree. The water temperature and the crappies are moving toward the bank in preparation for the spawn. Two weeks ago 2-inches of snow greeted anglers. Spring comes late this year to the Ozarks. 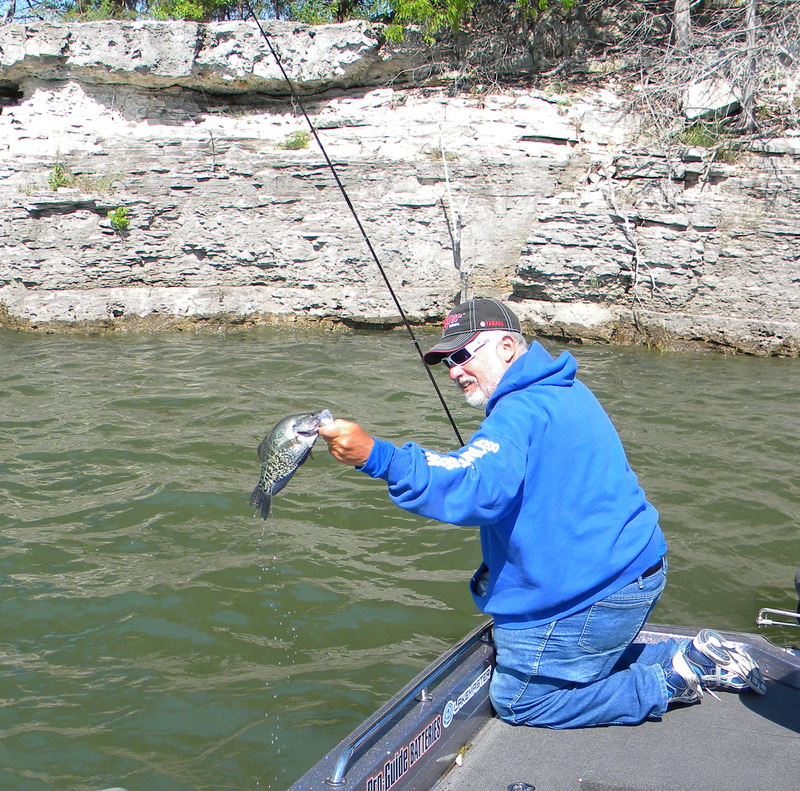 Rick LaPoint of Chauffeured Guide Service (800-869-2210) is the guide for this crappie fishing excursion that was originally a trout fishing trip on another lake in the area. Rick thought this would be fun and I agreed. We are in the James River arm of Table Rock Lake where we fished ditches and deep water coves. The Missouri Department of Conservation reports surveys of the area four largemouth bass in the 11-13 inch range. Spotted bass were in the 12-14 inch category. The black crappies in the fish surveys are in good numbers are running up to 10 inches. The white crappie population is fair with fish also up to 10 inches. Many fish habitat structures including brush piles, stump fields and rock piles are now in the lake. There is an interactive map of the structures available on the MDC public website at http://newmdcgis.mdc.mo.gov/tablerock. Crappies were there but we could only coax a few with our 1/16th ounce jig and Bobby Garland plastic minnow imitation of a minnow. The Razr rods from Ricks other company are spooled with 6 pound line. Although rather heavy for crappie fishing, the heavier line allows one to pull jig out of brush piles without breaking off. Rick recommends the use of stationary bobbers as opposed to the more often used slip bobber. His theory is that when jigging the lure back to the boat, it floats with the jig parallel to the surface. With the slip bobber the jig rises and falls in response to the line slipping through the bobber. Rick also believes the stationary bobber’s fixed position allows us to set the depth just enough to reach the top of the brush piles. We tip the jigs with Crappie Nibbles to help establish a scent trail in the water. In response to comments about the Sycamore trees growing right at the shoreline and falling into the water at some point, Rick points out that these trees absorb a lot of water. He explains that when they used to build fish attractors, it is not necessary to weight them down. They just readily absorb the water and sink on their own. The first part of our trip the catching is kind of bad. At one point we begin fish right up in the shallows just inches from the shore. We start to catch nice male crappies instead of the females we find on the brush piles in deeper water. The action picks up dramatically and in addition to a number of under sized crappies we catch 7 keeper fish as well as a Goggle eye and one small Largemouth Bass. Time is the enemy of all Outdoor Writers. All too soon it is time to put up the rods and do some pictures and an interview about fishing rods for an article. For the angler in search of some great catfish action, the southern tip of the state the place to go. Locals fish for them using all sorts of gear from the jugs to salt-water bait casting reels. Here are some of the better locations for catfishing. Part of the tradition of the south is catfishing in the summer. Southern Illinois is part of the south. After all, Marion, Illinois is actually south of Louisville, KY.
Crab Orchard Lake – This time of the year the best bet on the lake is the catfish action. Crab Orchard is accessible from Interstate 57 at Marion. The lake is a sprawling shallow body of water found on both sides of Route 13 about four miles west of the city. Mid-May the cats will be spawning in the shallow water. Leeches, cut bait and cheese baits all produce fish. Keep the later two on ice as they are susceptible to spoilage. Caught fish should also be iced rather than kept in live wells or on a stringer. To the south of Crab Orchard Lake on Spillway Road in the Crab Orchard National Wildlife Refuge is Little Grassy Lake. Little Grassy Lake is a heavily pressured lake this time of the year with the recreation canoe and kayak crowd using the lake during the daylight hours. However, for the angler willing to get out early in the day, catfish are around the points taking red worms, chicken livers, crickets, minnows and night crawlers. Further to the south, down in Alexander County, is Horseshoe Lake where anglers drift night crawlers along the bottom in the evening. The action holds up throughout the summer. Try the middle of the lake during the night. To the west of Carbondale, in Jackson County is Lake Murphysboro. This lake is next to Kinkaid Lake, famous for its Muskie fishery. In Lake Murphysboro, catfish action is also good in the evening but morning hours produce fish as well. Late in the summer, try fishing at night. Night crawlers, cut bait, minnows, leeches and stink baits work well. Up north of Marion in Franklin County is Rend Lake. The lake straddles Interstate 57 at Exit 77. Rend Lake is a large reservoir that is full of bragging size catfish. The action remains excellent in 3 to 4 feet of water. The best action comes in the coves and along the riprap. Fish take cut bait, worms, crickets, leeches, and shrimp. This summer may be just the time to explore the south, south Illinois that is! As the old song goes, it is summertime and the catfish are jumping. Montauk State Park is one of many very attractive parks in the Missouri State Park system. Whenever visiting the Missouri Ozarks, it is a prime location for catching trout. Just downstream from form the park the river continues its procession into the Ozarks. Trout anglers from across the nation ply these waters in search of rainbow trout. They share the crystal clear waters with such mammals as mink, muskrat, beaver and an occasional otter. White-tailed deer sometimes drink along the bank. The park is a veritable paradise for wildlife. Fish cleaning stations provide a place to clean the catch. By grinding up the fish waste it is useable later by pumping out the tanks. The contents make fertilizer for trees at the state nursery. There are a number of rules and ethics that apply to the use of this stream. Check in at the lodge headquarters to pay the minimal daily fee and to pick up a copy of the rules and regulations as well as a map of the park. Certain areas of the river have lure and bait restrictions. On this warm spring day the shade of the overhanging brush and hardwood is interrupted by an occasional splash of sunlight. 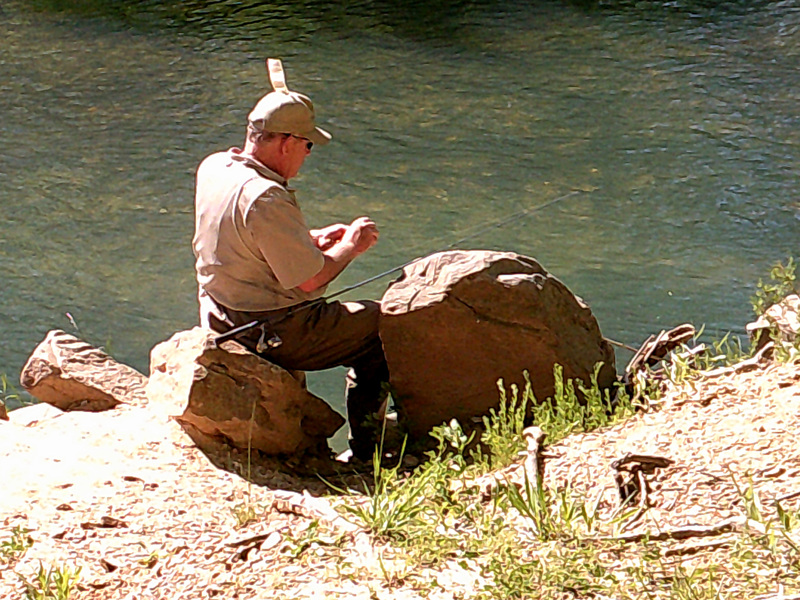 The shaded portions and deeper pools attract trout to any interruption in the current. Interruptions come in the form of rocks and logs as well as the lip of any hole. The fish rest in these areas before blasting out into the current to gobble some passing morsel of food. By casting into the current upstream from where the trout lie in wait, you are able to control the drift of a lure closer to the shore for further away. With a very small float or bobber you can adjust the depth at which the lure travels. It is a good idea to keep the bait at the same depth. Fishing with ultra-light tackle enhances the excitement of hooking a fish. A new Shakespeare Micro Series Combo with 2-pound monofilament line and a small Road Runner is just the ticket. By tipping the hook with Gulp Alive Hellgrammite or one of the trout baits in the same series. The 7-foot length and premium graphite construction allow the rod to do much of the work in recovering the fish. The quiet of this stretch of the river tends to lull you into tranquil thoughts. Suddenly the water explodes with a splashing trout. It is splendiferous. He is about 10-inches in length and no match for the 11-pounder taken a couple of years ago by a soldier on leave before deploying overseas. The park is located southeast of Licking, MO. The season is open from March 1 to October 31. Small lakes are miniatures of big ones. Bass respond to habitat conditions in just the same way they do in larger bodies of water. What happens in lakes also happens in the small lake, only more quickly. Smaller lakes are an excellent place for a spring tune-up. Under the rays of early spring sun, the water warms more quickly. This is especially true if the bottom is dark. A spurt of warm weather will bring the water temperature up. The smart angler takes advantage of freak weather conditions. The downside is that a cold front can move through and the bass will get lock jaw. They just quit biting. Fish react just as quickly to negative fishing conditions as they do to the positive ones. Easing around the bank of a small lake, targeting specific structure can be a very successful way to fish. Some attractive spots might be where a bush over hangs the water or will otherwise cast shadows on the water. Drop offs into visible holes are a good place to check with a few casts. Approaching quietly is important. It is important to minimize any shadows cast toward the water. Bass are quick to respond to perceived threats such as a shadow on the water or the outline of an angler on the shoreline. Key to a fish’ existence is cover, oxygen and food. Weeds are a good place to look as they produce oxygen, supply cover and attract baitfish, bugs and other food species. Work edges, pockets, and clusters of weeds thoroughly. Cast into and around them. Single fish will hold on distinct shoreline objects such as drop offs, points and feeder creeks. Wood is a prime cover for bass. Stumps, brush, fallen trees are favored over open water. It is all the better if there are not a lot of them. As for tackle, the same equipment works well on mini‑lakes as on the bigger ones. Sometimes one might downsize the lures. That is, where a 6-inch worm is best for larger waters, a four-inch one is good for the small bodies of water. Lures of every type from jigs, worms, spinners, buzzbaits, stickbaits to crankbaits can be very effective. It helps to learn the movement of nature. Make you minnow bait imitate a real one. The lure must look alive, frightened and catchable to the fish. As one becomes more familiar with a small body of water, it can become a laboratory for testing equipment or techniques. The workable area provides an opportunity to test out an idea in an area where one knows what does work. You can cover small bodies of water thoroughly in less time, thus increasing the effectiveness of putting your lure in front of a fish. Six hours and you can cover most small lakes completely. 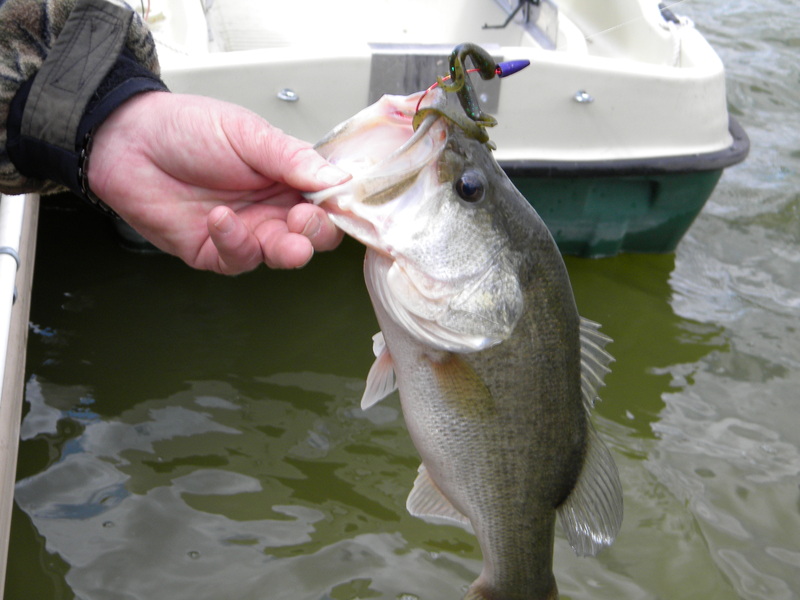 Learn to use a jig or worm and fish around structure, open holes, or any change in structure. What catches bass are the attracting and triggering qualities of an artificial lure. Bass must be attracted and then something in the movement of the bait gets him to eat it. In choosing a lure a bright color will attract a bass as he feeds primarily by sight. However, a natural color pattern can convince them that it is worth eating. Obviously, finding a lure that has both characteristics is impossible. Perhaps compromise is the secret. Because of the limited amount of fish, it is important to keep the population in balance. Releasing fish lets those big ones grow all the more for your next foray. It is catfish time as other fishing begins to slow. Following the prime spring spawning seasons and increasing summer temperatures the catfish action is prime. It is a time when a sharp pull on a line that works away from the angler signals catfish dinner is just a short time away. 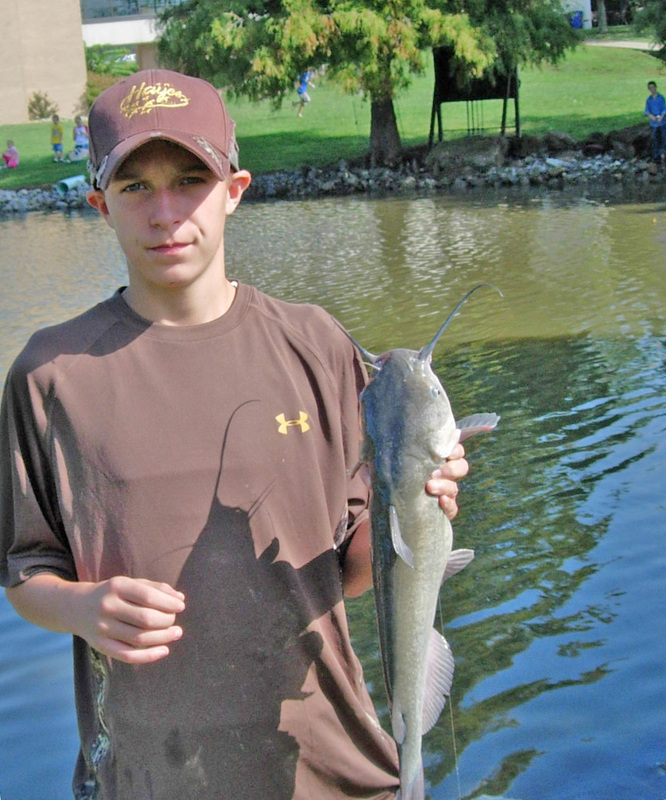 In Williamson County and elsewhere in southern Illinois, catfish are in abundance. The variety of waters and state stocking programs result in a catfish fishery second to none. In summer, catfish tend to hole up in areas downstream from dams and other man-made structures. They seek out deep holes resting on the upstream side out of the current. Absent a hole, cats lay up behind a piece of structure out of the current. In this way they conserve energy and yet are able to move out into the current to partake of some hapless piece of forage that might float past. Catfishing is an inexpensive sport that is also easy to learn. To be successful does not require a large investment. Basic spinning, spin casting, or bait casting reels on long rods are the bulwark of the sport. Terminal tackle consists of heavy lead weights, circle hooks, and a float to suspend the bait at a desired depth. Because of the heavy weight and fighting ability of many catfish, braided line is often used. Otherwise, line in the heavier weight classes is best. The choice of tackle is often the result of experience and the preference of the angler. The choice of bait for catfishing often tends to be a matter of just how much your stomach can stand. Catfish baits are notorious for the strong odors they emit. Catfish seek out food sources by scent, including such things as cuts of shad, nightcrawlers and minnows. In small ponds, the catfish will greedily devour night crawlers, red worms and cheese baits. In medium size rivers, the preferred baits are chicken and turkey liver, dip worm coated with stinky cheese bait. In big rivers, all of the above are applicable but so too are live fish, cut shad and crankbaits. Bluegills and shad are the preferred live fish baits. Regardless of the type of water, catfish tend to feed in the evening, early morning and nighttime during the summer. It is probably due to their remaining deep in cool water during the day for comfort. Then as the shallow water begins to cool, they will move up to feed on the natural feed available. The exception is when it rains. Following a summer shower, the water cools a little and it seems to encourage feeding habits of the catfish. It is also possible that rain washes some of the terrestrial insects into the water and the fish find them tasty. There are probably more catfish taken from shore than from a boat. However, boated fish are usually larger. This is more a function of ability to get to where the big ones hide. Most shore caught fish are part of a put and take situation. 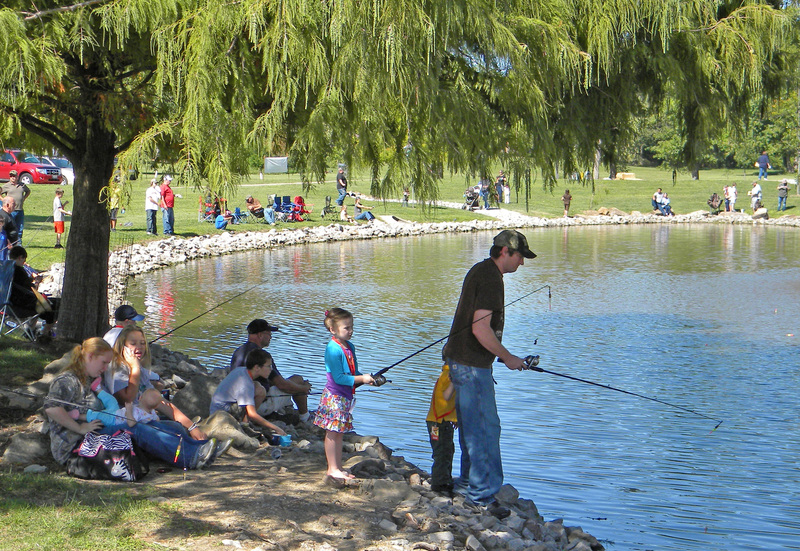 Small ponds and lakes are often stocked by wildlife agencies as part of programs to introduce kids and novice anglers to the sport of fishing. These programs are very popular and most public waters contain stocked catfish. The hatchery raised fish are stocked by various private and public organizations. Medium sized lakes and some of the larger rivers are also accessible to shore anglers. In the evenings and early morning, the cats in these waters will move about in the shallows to feed. The rest of the day they hole up in deep holes or near stumps. The key to success is to fish all the water both horizontally and vertically. Anglers will cast to the holes with bait suspended beneath an adjustable float. If not fish bites within 20 minutes, the angler retrieves his bait and moves to another location. Then repeat the process. The systematic angler will fish the bottom of the water column first. If no bite is received the middle of the column depth is tried and finally the top portion. Most fish are in either the bottom or the top one foot of depth. Contrary to the popular song of the 60’s “Summertime” the catfish do not usually jump. But here in southern Illinois they are still biting and fighting. Give it a try this summer.